well cant find a link off hand but i tbhink i have a picture in my quad folder. where iv been storing pictures of my project. voltage/buzzer and put it on your multicoptor.. and figure out the average time you have, then setup the timer on your TX.. and you will be safe from abusing your LIpos from dropping them below there recommended voltage. cheap insurance for me.. i like the idea.. i did have to get a adapter tho so i can mount it in a better location on my MR.. so i can see the voltage by just looking at it.. as of now since the balance cable is so short on these battery i just zip tied it to where the camera would normally go. be safe. my body is so broken.. trust me..anything you can do to stay healthy i highly recommend it ie.. watch your battery's, and no tuning in the house with props on. Don't forget terra cotta / ceramic pot, tile, pave stone, brick, etc. which are also non-conductive and fire proof. Dont underestimate my ability to defeat idiot proof stuff! always you always ALWAYS balance charge. . . I do and did. But that doesnt help if there still is a 4S battery connected to the XT60 adapter lead (for some reason, I only unplugged the balance lead after charging) and you then connect a 6S to the XT90 connector and you start balance charging that one. There is no way for even the smartest charger to prevent what will happen next. And even if there was, Im sure I could find other ways to defeat its idiot proofness . Let me also tell you there was not much time for hissing or puffing. Not necessarily if you have a smoke detector and something to contain the initial explosion. And of course, you dont leave the house. I wouldnt have much faith Terra cotta would survive the explosion. Ive seen tests where they overcharged lipo's in a vented ammobox that had a pretty big hole and exhaust, and the lipo explosion still blew the lid off that. Of course you could make it very open so that there is no pressure building up, but then you also dont contain the fire. When my lipo blew up, the entire room was littered with small smoking/burning fragments, seemed like paper, leaving burn marks all over the place. It was like a small volcano erupted in the room. Yeah, I got myself one sort of like the one in the picture you posted. Mine is a venom I think. Right now since my 3s doesn't provide enough power at 11.3v I haven't worried about it to much. But I figure I'll want to put a little Velcro on it and attach it to my hex while flying once I get a 4s. 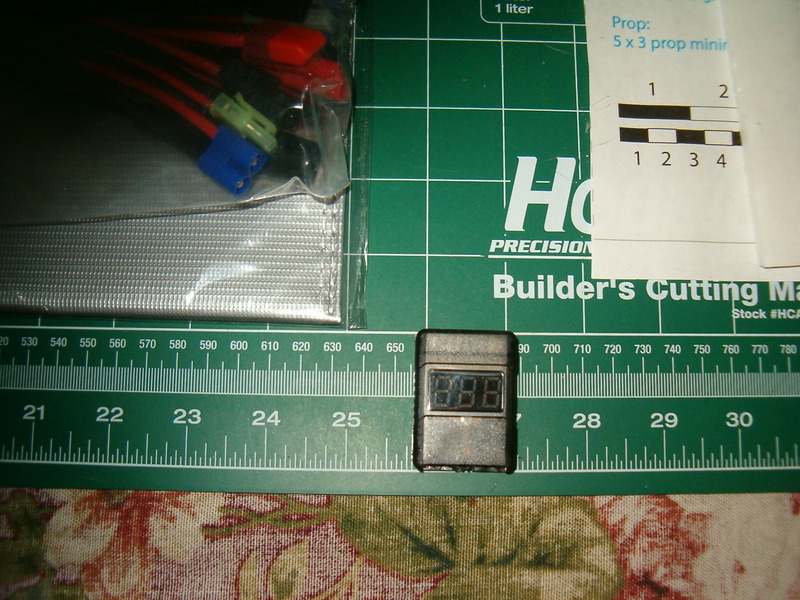 Hobbykings lipo's are cheap, definitely not very high end, but probably among the most commonly used batteries and therefore plenty good enough. Ive had one or two duds over the years, but you'd expect that given their price, and its not like they spontaneously exploded or something, just one cell that died prematurely for no apparent reason. FWIW, Ive had better luck with the generic blue turnigy's than the more expensive turnigy nano techs. Not sure my sample size is big enough to draw sweeping conclusions, but either way, its a well known brand, its not dodgy, and its what I would have bought. 35C, is that for a 5000mAH ? Is that burst or sustained? Theoretically 35C means 35x5= 175 amps, or ~30A per motor for a hex. In reality those values are generally widely exaggerated (by all brands) and I wouldnt trust them to pull much more than half their rated current continually. Im not sure how much power your hexa pulls, but your battery is probably not over specced in that sense. Im sure it will work, but you may lose a bit of peak power. Yeah, From my searching online I've heard of others who didn't like the nano tech batteries as well. If you see the second video on page 2, the guy used a similar pot that probably would have saved him significant injury if it had ignited whilst he was carrying it to the outside. Were someone not to have something like that it would probably also work to grab something glass or ceramic from the kitchen as many are microwave and/or oven proof. Again, all are better options than letting it catch or damage other things more than sitting on a flame proof surface as simple as a 99 cent ceramic tile. Ideally, battery problems should show up much earlier while being discharged in use than charged 10-20 times slower. Once battery discharge issues become excessive, better to cycle into use less to allow more chemical rest, leave in fridge or freezer at 3.7-3.8 volts, and / or use for fpv, etc. Like most here, I have used the blues, and I have a bunch of nanos that span from 45c to 120c, and also have a couple of A-Spec nanos. I like them all. The blues are decent, and for the money, they are a great budget battery. But I do prefer nanos. My A-Specs do have a strong initial curve, but after about 4 minutes, they settle down and act like 'regular' nano higher c units. But as zoom says, my sample size of A-Spec is very small. I have heard some vocal complainers about the Nanotech batteries, but if you want a high-C battery for a 250 class mini at a decent price, they're kind of all you can find. So I got some 1500 mAh 35-70C Nanotechs and have been completely happy with them. I have both a voltage and a charge readout on my OSD, so I run the batteries to 80% (1200 mAh) and then land and pay attention to the resting voltage. If the resting voltage starts dropping, I'll know the battery's capacity is lower. I've probably got 20 or so cycles on them by now and there has been little reduction in capacity as far as I can tell. Interesting, maybe I'll have to give them a try and see. Since I've discovered the onboard telemetry system that sends my total voltage back to my TX I now know that I can actually fly till my battery reaches about 10.8v. About that time the craft has trouble holding a hover at mid throttle. This is without the camera and gimbal. At around 3.6v per cell, there is loss of power and sometimes throttle stutter or drop out. Part of this is relative to the overall setup. Props on the larger side (of recommended), motors running on the slower side (of optimized rating), and a near minimum or lower C - rated battery--combined with the low voltage, (it is my guess), can cause (A) amp and (V) voltage spikes that exacerbate the dwindling power situation. The right motors at the right rpm with the right props, (everything else), and the right (high enough) C - rated battery, as well an unburdening all-up-weight, will probably see a fair amount less of this general type of issue. The more you can stay out of the tens with 3S, the longer your batteries will last. And dipping down into the low and mid 10's on a regular basis really ages a battery. Sorry, this might be a stupid question, but what do you mean when you say "all-up-weight"? It seems kind off add to me that when I charge my battery (11,000 mAh) I only ever put about 4 to 5k mAh back in. The battery is supposedly a "true 40c"
Anyway, I received my 4s battery today, it has a tx90 connector, so I have to do some adapting to make it work. AM I correct that a battery really doesn't need a tx90 connector unless it is a 5s or higher? I think at 10.5 my hex is coming down on its own. typically I land and recharge around the 11.3, which if I've figured correctly is about the 10.8 under load. With t he 4s I assume I'll have to watch and be much more careful since at 13.2 v the hex should still fly fine even though I have reached the point where the battery can be damaged. All up weight (AUW) is the term people use to refer to what ever the craft / rig weighs to be in full function and flight. From what I understand, the C-rating simply refers to the (A) Amp-rating, as a constant / maximum, with the rest being relative, x C = x Amps, which is the rate rather than capacity of battery discharge. Watts, (power at motors), is the product of Amps multiplied by Voltage. The battery connector has most to depend on how many Amps your setup will use, rather than how many the battery could be capable of. Most people seem to use XT60 connector up to near, at, or above 100 amps and 4S-5S voltage with no problem, although I have also seen somewhere that the 60 refers to some specification of the Amp rating. I think you would want to stay above 14.8v with the 4 cell, as 3.7v is the base minimum voltage specified per lipo cell. If you do not already have something to indicate this, you should probably get a lipo checker to fly with and set it to beep at 3.6-3.8 per cell, or at what ever value you prefer for your setup. A good target is that you can draw about 80% of a battery's rated capacity from it. When I draw my 1500 mAh 3S battery down 1200 mAh, the voltage under load is typically between 10.6 and 10.8 volts, and the resting voltage is typically 11.0 to 11.2 volts. This is basically consistent with the recommendations made elsewhere on this thread. If you are only putting 4 to 5 Ah in, then you can probably safely discharge the battery further. What's your resting voltage when you're done? Side note: 5 k mAh = 5 * 1000 (Kilo) / 1000 (milli) = 5 Ah. The K and m cancel out. An XT60 connector is rated to at least 60 amps continuous load, and many people run them higher than that. The rating has to do with the connector's ability to tolerate heat without melting or burning. The XT90 on your battery is probably used by the vendor to be safe, since 40C * 11 Ah = 440 amps the battery can theoretically provide. But in reality, you're probably not pulling over 60-100 amps, so you're probably fine with an XT60. He's flying a heavy hexa with oversized props. Safe bet he is pulling >100A peak, and enough so to warrant XT90's.